There is a story that Baron Haussmann, who rebuilt Paris in the middle of the last century, on his deathbed wished all his work undone. — Would that it died with me! he is supposed to have said, though as he died of a congestion of the lungs his last words may have been garbled. If the doctor who heard them and, astonished, wrote them down, made no mistake, then we’re left with a riddle, for in life Haussmann seemed incapable of regret. Regret is a backward-turning emotion, and the Baron was famous for rectilinearity; he straightened the boulevards and razed the crooked neighborhoods where tanner’s sheds fronted cracked courtyards and sewer-ditches spilled over into the bins of wire and paper petals of the artificial flower-makers for which the city, before his arrival on the scene, was famous. To Haussmann’s German name and the sense of order which, we can only assume, came with it, we owe the sidewalk cafés with their six tiers of wicker chairs, the public urinals and Morris columns for theatrical advertisements, the insane asylum of Sainte-Anne and the park at Boulogne; to him we owe the rows of plane-trees which in summer catch dust and sunlight in their leaves, and the pastime of strolling which caught on as the sidewalk widened into the twentieth century. Stop a moment on the avenue Foch, one afternoon, and thank Haussmann; stop again on the boulevard Raspail on your way home, weigh the oblong package of dates tucked under your arm and wonder why the Baron, having made all this, wished it undone? Was it selfishness? Or as death approached did he see for the first time that the Emperor had been wrong, the speculators had been wrong, the engineers had been wrong, he had been wrong—did he see that, in all his work, there was something to regret? What happened next was, I met a woman on BART, San Francisco’s subway system, who was reading a French novel. I thought she was French, so I started speaking to her in that language, and she answered me. We had a conversation between stops, and she gave me her number. A few days later, she invited me over to her apartment. I brought a bottle of wine, and we drank it, but nothing in particular happened. We might have talked about Paris; we might have snuggled briefly on a sofa. What I know for certain is that I came home full of regret at what might have been, if only I’d been a better talker, and I opened up the file where I had left this regret-filled paragraph and began to answer his question with a story about a French girl. This became Haussmann, or the Distinction. Later, I learned that the girl I’d met wasn’t French, but Polish. And not Polish Polish either, but Polish-American. Her family lived in the Bay Area, which explains what she was doing on BART. I think it makes the story better: I was in love with her, and we were both in love with another country, not our own, where neither of us lived. I worked on Haussmann for five years. I never changed the first paragraph. 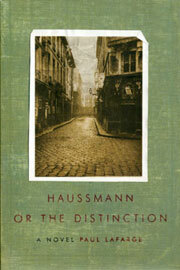 Haussmann, or the Distinction won the Bay Area Book Reviewers’ Award for fiction, and was a New York Times Notable Book for 2001. You can order a copy from Amazon or Barnes & Noble or Indie Bound.